In the digital age, new tools and pathways that attract the public’s eye – from YouTube to Twitter – can quickly be noticed by journalists and news organizations as important parts of the news landscape. A new study by Pew Research Center examines one of these emerging tools: crowdfunded journalism, in which projects can be proposed and funded through online appeals to the public. 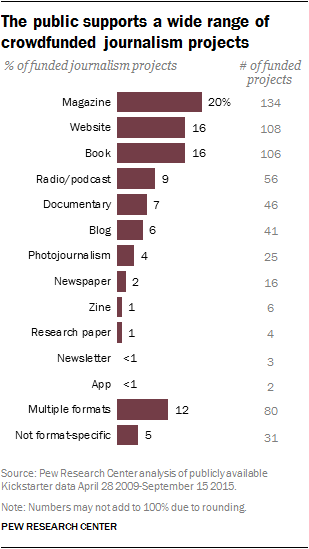 The report examined the 658 journalism projects funded through Kickstarter, one of the largest single platforms for crowdfunding journalism, from April 28, 2009 (the day it launched) through Sept. 15, 2015. Though the revenue involved and amount of content produced are nowhere near what comes through the more mainstream media, crowdfunding can help bring to reality work that might otherwise not see the light of day. One striking characteristic of these projects is the wide range of initiatives that have received funding, which we explore here. Many serious journalism projects received crowdfunding, but the form allows for projects about less weighty matters as well. For instance, in early 2015, Kickstarter contributors kicked in $3,605 to help crime reporter Scott Thomas Anderson in his effort to turn material gathered during 16 months of work embedded with law enforcement agencies into a book about the intersection of prison culture, crime and the underfunding of mental health care. Later in the year, backers pledged $4,676 in support for the production of a documentary to tell the stories of refugees at the Serbian-Hungarian border. At the same time, supporters pledged $10,032 for a story about the 2014 World Laser Tag Championships. And fans of Godzilla helped the host of a podcast about the movie monster raise over $19,000 – more than double his original goal – to travel to Japan’s Big Godzilla Special Effects Exhibition and produce a feature-length documentary. Both traditional and high-tech projects have found funding. For example, among the 106 book projects funded – one was a biography of a bush pilot – 89 planned to use funds for printing hard copies. Newspaper and magazine efforts often focused specifically on print products as well, including a summer edition of the University of South Florida at St. Petersburg’s student newspaper. Toward the other end of the technological spectrum, a proposal for a multimedia news website featuring firsthand accounts from Southern Sudan, Nuba Reports, garnered $44,856, more than double its goal. Another journalist, in 2011, followed a Libyan-born man back to his war-torn home country and chronicled his efforts to help rebuild, producing reports in multiple media formats, including print, blog, audio, photos and video. Seven-in-ten funded projects (71%) have been produced by individuals, whether alone or working in small groups. Three graduate students of religion received $1,051 to produce a monthly podcast examining religion from an academic perspective. And a female student of Thai kickboxing sought to share her experiences and provide a website and blog as a resource for other female devotees of the sport. Schools also produced a wide array of projects. One Canadian fourth-grade class looked for funds to enable a student to write a blog post about an astronaut, and a university in the U.K. sought funds to offset a shortfall in campus funds for a student publication. But some established news organizations have also gotten into the mix. For instance, TucsonSentinel.com received funding to photograph the entirety of the Arizona-Mexico border and produce a book, documentary and exhibit including interviews with residents along the border. And the Pulitzer Prize-winning website PolitiFact attracted over $20,000 in pledges for instant fact-checking of President Obama’s 2015 State of the Union address and the Republican response. While some projects sought funding to keep doing what they were already doing or expand in some way, about as many were looking to create something that was altogether new. Among projects seeking to expand upon existing work were one requesting funds to launch a training event in Tunisia to teach citizens about digital media, online journalism and the power of a free press, and another from the International Policy Digest to assist in a new partnership agreement with Agence France Press. Startup endeavors included a project from a group of instructors to develop a curriculum for a data journalism course, as well as a less traditional project by two individuals blogging about their drive from the U.S. to the southern end of Chile who needed funding for a cargo boat to transport them and their truck over a roadless part of their journey. There was a wide range in the number of project contributors and the amounts they pledged. Projects ranged from a single backer to 3,116, with nearly 70% of projects attracting fewer than 100 backers and 22% of projects with 25 or fewer. Three backers pledged a total of $500 for a book about Tibetan refugees in India, while more than 1,000 people gave money for a bicycle-based delivery service for the San Francisco Public Press. The dollar amounts sought varied widely as well, from a dozen projects that brought in less than $100 each to 10 projects attracting $70,000 or more. The journalism project that attracted the highest amount of pledged funding was the 2012 launch of Matter, a project dedicated to long-form journalism about big issues in technology and science. This proposal reached its initial goal of $50,000 in just two days, and ultimately went on to raise a total of $140,201.